On Friday, we got the first estimate of second quarter GDP, which came in at a much lower than expected 1.2% annualized growth rate from the first quarter. The first quarter itself was even revised lower and has a final print of being up just 0.8% from the fourth quarter of 2015. Looking at the numbers by themselves, one would think that the economy is pretty weak, especially by historical standards. The Wall Street Journal pointed this out in an article on Friday, headlined "U.S. GDP Grew a Disappointing 1.2% in Second Quarter." It's fairly disheartening and paints a pretty bleak picture of the economy. To me, the article brings up a much larger question: how accurate is GDP data? Furthermore, does it make sense that an economy with a historically low level of unemployment is also low growth? Does it make sense for two national economic indicators like the ISM reports on manufacturing and services to be well in expansionary territory, but the economy be considered weak and low growth? That just doesn't make sense to me. This brings me to two of the most important and fundamental concepts in investing, which are price and value. Price can be defined as what an asset costs, while value speaks to what that asset may really be worth. Since price is directly observable in the market, it is rather unambiguous, whereas value is a much more complex and relative concept. Depending on the assumptions that an investor uses, value can be significantly different from price, which is why thoughtful analysis can bring great reward. All that being said, I would argue that 1.2% growth is not an accurate "price" for the economy; nor is the economy being valued properly. Growth has been slowing. However, technology is playing an ever greater and growing role in the economy -- and it is not being valued properly in those growth figures. Combining technology with the evolution of the economy from a manufacturing /export base to a services/consumption one has made valuing the economy that much more difficult. The pervasiveness of technology through business and all of its secondary effects is simply not known. Investment in software has grown rapidly over the last decade, but statistics have not been able to capture the implications of that growth. This is what makes trying to value the economy as much an exercise of art as it is science. Taking this past week's earnings surprises from Action Alerts PLUS portfolio holdings Facebook (FB) and Google (GOOGL) and Growth Seeker portfolio name Amazon.com (AMZN) as an example of how Wall Street is unable to value the dynamic of technology and business, it is very understandable how government statistics are not being valued properly either. When a company like Stanley Black & Decker (SWK) uses software from salesforce.com (CRM) to reduce its administrative support needs and the associated capital expenditures that came with that infrastructure, we get reduced non-residential fixed investment. 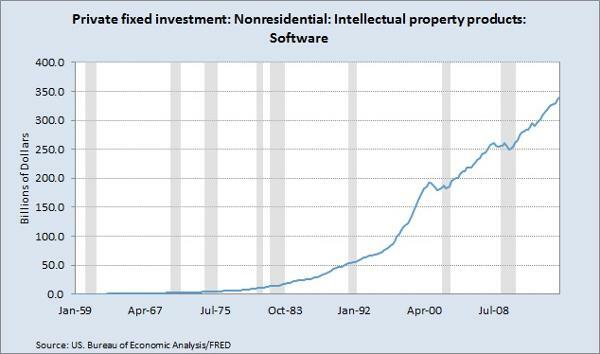 Even though the purchase of software is a part of the non-residential fixed investment component of GDP, the net effect is an overall lowering of investment. If software wasn't lowering costs, it really wouldn't be doing its job. So while fixed investment is in decline, it is in decline for the right reasons, not simply because business is bad. The good news from Friday's GDP report and the justification for this bull market to keep on going is that consumption is running at a solid pace, up 4.2% from last quarter. Unfortunately, most of financial media still treats consumption as if it were just a small component of the economy when it really is the best measure of its overall health. The fact is, healthy levels of consumption are only possible with a healthy labor market, which comes from a healthy business environment. Sometimes, the economy can be broken down to just the basics where things actually do all make sense. At the time of publication, Mazzocco had no positions in the stocks mentioned.